Bought this because it was a really cheap option. You get what you pay for. Doesn't stay centered making it cumbersome to use. Constantly needs to be reset if you don't tighten down the shellholder with a tool, which takes more time. 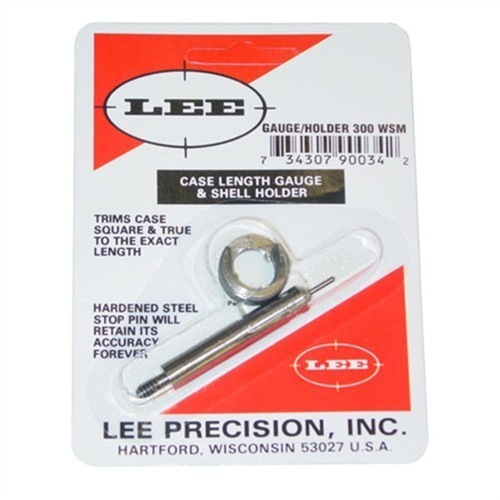 Slightly dangerous to use because the case can slip out of the shellholder without warning. Would not buy again for any other caliber. I use these in .223 and .308. I started with the .223 while loading for my AR's. I've trimmed thousands of .223 cases and it's just still the exact same measurement as the first case and the attached cutter seems as sharp as ever. I normally chuck the shell holder in a portable drill and process a bunch of brass at a time. I'm loading .308 for a precision bolt action, and I've been able to produce extremely accurate ammunition. You would of course have more flexibility with an adjustable trimmer, but for this particular rifle the set length available here is fine. Consistency is the key and every piece of brass comes out the exact same length with this tool.